This page is about the city and county in California. For other uses, see San Francisco (disambiguation). San Francisco (SF) (/sæn frənˈsɪskoʊ/, Spanish for Saint Francis; Spanish: [san fran.ˈθis.ko]), officially the City and County of San Francisco, is the cultural, commercial, and financial center of Northern California. It is the birthplace of the United Nations. 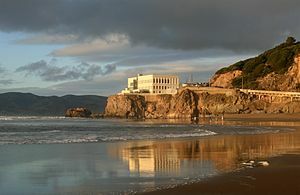 Located at the north end of the San Francisco Peninsula, San Francisco is about 47.9 square miles (124 km2) in area, making it the smallest county—and the only consolidated city-county—within the state of California. 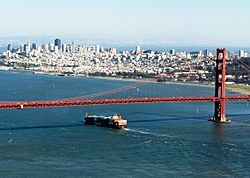 With a density of about 18,451 people per square mile (7,124 people per km2), San Francisco is the most densely settled large city (population greater than 200,000) in California and the second-most densely populated major city in the United States after New York City. San Francisco is the fourth-most populous city in California, after Los Angeles, San Diego, and San Jose, and the 13th-most populous city in the United States—with a census-estimated 2015 population of 864,816. The city and its surrounding areas are known as the San Francisco Bay Area, and are a part of the larger OMB-designated San Jose-San Francisco-Oakland combined statistical area, the fifth most populous in the nation with an estimated population of 8.7 million. 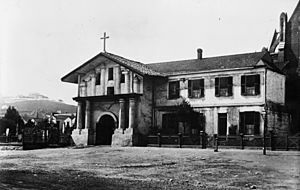 San Francisco (Spanish for Saint Francis) was founded on June 29, 1776, when colonists from Spain established Presidio of San Francisco at the Golden Gate and Mission San Francisco de Asís named for St. Francis of Assisi a few miles away. The California Gold Rush of 1849 brought rapid growth, making it the largest city on the West Coast at the time. 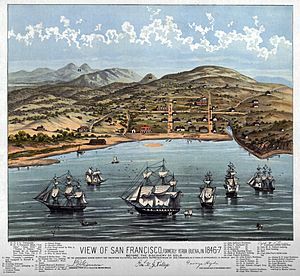 San Francisco became a consolidated city-county in 1856. 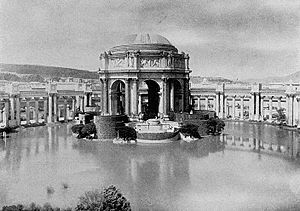 After three-quarters of the city was destroyed by the 1906 earthquake and fire, San Francisco was quickly rebuilt, hosting the Panama-Pacific International Exposition nine years later. 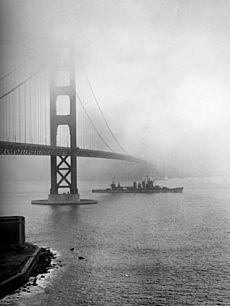 In World War II, San Francisco was the port of embarkation for service members shipping out to the Pacific Theater. After the war, the confluence of returning servicemen, massive immigration, liberalizing attitudes, along with the rise of the "hippie" counterculture, the Peace Movement growing from opposition to United States involvement in the Vietnam War, and other factors led to the Summer of Love and the gay rights movement, cementing San Francisco as a center of liberal activism in the United States. Politically, the city votes strongly along liberal Democratic Party lines. A popular tourist destination, San Francisco is known for its cool summers, fog, steep rolling hills, eclectic mix of architecture, and landmarks, including the Golden Gate Bridge, cable cars, the former Alcatraz Federal Penitentiary, Fisherman's Wharf, and its Chinatown district. 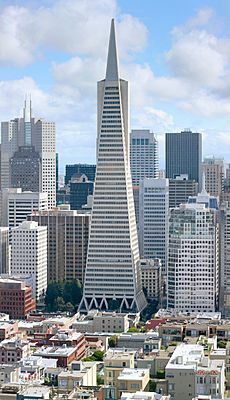 San Francisco is also the headquarters of five major banking institutions and various other companies such as Levi Strauss & Co., Gap Inc., Salesforce.com, Dropbox, Reddit, Square, Inc., Dolby, Airbnb, Weebly, Pacific Gas and Electric Company, Yelp, Pinterest, Twitter, Uber, Lyft, Mozilla, Wikimedia Foundation, and Craigslist. It has several nicknames, including "The City by the Bay", "Fog City", "San Fran", and "Frisco", as well as older ones like "The City that Knows How", "Baghdad by the Bay", "The Paris of the West", or simply "The City". As of 2016[update], San Francisco is ranked high on world liveability rankings. The California Gold Rush brought a flood of treasure seekers (known as "forty-niners", as in "1849"). 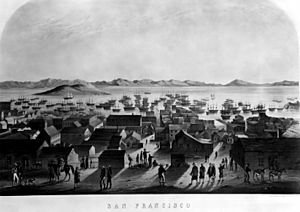 With their sourdough bread in tow, prospectors accumulated in San Francisco over rival Benicia, raising the population from 1,000 in 1848 to 25,000 by December 1849. 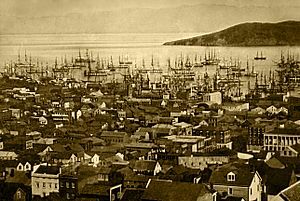 The promise of fabulous riches was so strong that crews on arriving vessels deserted and rushed off to the gold fields, leaving behind a forest of masts in San Francisco harbor. Some of these approximately 500 abandoned ships were used at times as storeships, saloons and hotels; many were left to rot and some were sunk to establish title to the underwater lot. By 1851 the harbor was extended out into the bay by wharves while buildings were erected on piles among the ships. 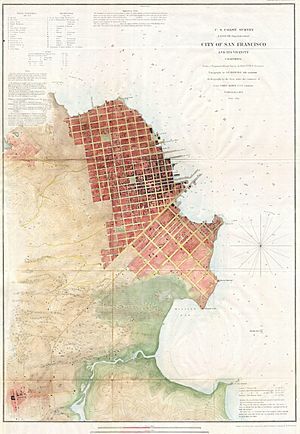 By 1870 Yerba Buena Cove had been filled to create new land. Buried ships are occasionally exposed when foundations are dug for new buildings. 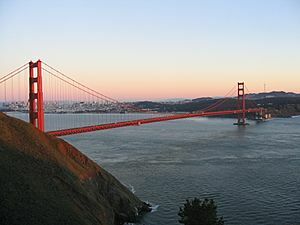 California was quickly granted statehood, and the U.S. military built Fort Point at the Golden Gate and a fort on Alcatraz Island to secure the San Francisco Bay. Silver discoveries, including the Comstock Lode in 1859, further drove rapid population growth. Over this period, San Francisco became a magnet for America's counterculture. Beat Generation writers fueled the San Francisco Renaissance and centered on the North Beach neighborhood in the 1950s. Hippies flocked to Haight-Ashbury in the 1960s, reaching a peak with the 1967 Summer of Love. 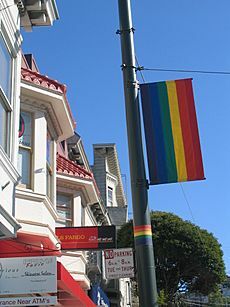 In the 1970s, the city became a center of the gay rights movement, with the emergence of The Castro as an urban gay village, the election of Harvey Milk to the Board of Supervisors, and his assassination, along with that of Mayor George Moscone, in 1978. The last 20 years have seen two booms driven by the internet industry. First was the dot-com boom of the late 1990s, startup companies invigorated the San Francisco economy. Large numbers of entrepreneurs and computer application developers moved into the city, followed by marketing, design, and sales professionals, changing the social landscape as once-poorer neighborhoods became increasingly gentrified. Demand for new housing and office space ignited a second wave of high-rise development, this time in the South of Market district. By 2000, the city's population reached new highs, surpassing the previous record set in 1950. When the bubble burst in 2001, many of these companies folded and their employees were laid off. Yet high technology and entrepreneurship remain mainstays of the San Francisco economy. By the mid 2000s (decade), the social media boom had begun, with San Francisco becoming a popular location for tech offices and a popular place to live for people employed in Silicon Valley companies such as Apple and Google. There are more than 50 hills within city limits. 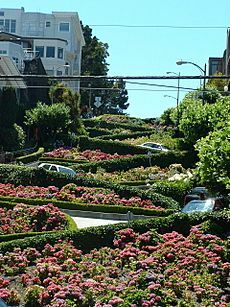 Some neighborhoods are named after the hill on which they are situated, including Nob Hill, Potrero Hill, and Russian Hill. Near the geographic center of the city, southwest of the downtown area, are a series of less densely populated hills. 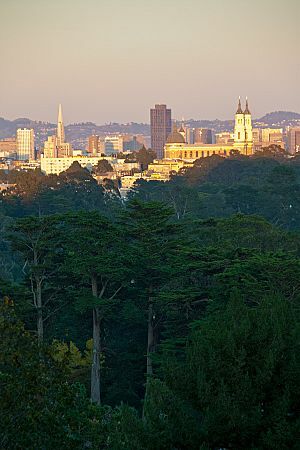 Twin Peaks, a pair of hills forming one of the city's highest points, forms a popular overlook spot. San Francisco's tallest hill, Mount Davidson, is 928 feet (283 m) high and is capped with a 103-foot (31 m) tall cross built in 1934. Dominating this area is Sutro Tower, a large red and white radio and television transmission tower. San Francisco's shoreline has grown beyond its natural limits. Entire neighborhoods such as the Marina, Mission Bay, and Hunters Point, as well as large sections of the Embarcadero, sit on areas of landfill. 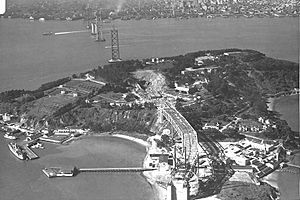 Treasure Island was constructed from material dredged from the bay as well as material resulting from tunneling through Yerba Buena Island during the construction of the Bay Bridge. Such land tends to be unstable during earthquakes. The resulting soil liquefaction causes extensive damage to property built upon it, as was evidenced in the Marina district during the 1989 Loma Prieta earthquake. Most of the city's natural watercourses, such as Islais Creek and Mission Creek, have been culverted and built over, although the Public Utilities Commission is studying proposals to daylight or restore some creeks. Downtown San Francisco, seen from Twin Peaks at dusk, in December 2009. 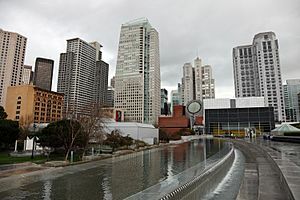 The historic center of San Francisco is the northeast quadrant of the city anchored by Market Street and the waterfront. It is here that the Financial District is centered, with Union Square, the principal shopping and hotel district, and the Tenderloin nearby. 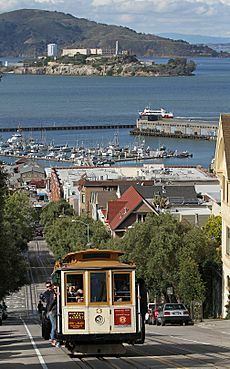 Cable cars carry riders up steep inclines to the summit of Nob Hill, once the home of the city's business tycoons, and down to the waterfront tourist attractions of Fisherman's Wharf, and Pier 39, where many restaurants feature Dungeness crab from a still-active fishing industry. Also in this quadrant are Russian Hill, a residential neighborhood with the famously crooked Lombard Street; North Beach, the city's Little Italy and the former center of the Beat Generation; and Telegraph Hill, which features Coit Tower. 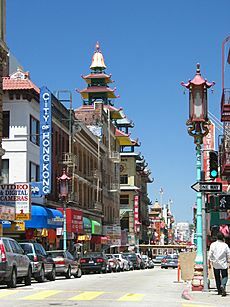 Abutting Russian Hill and North Beach is San Francisco's Chinatown, the oldest Chinatown in North America. The South of Market, which was once San Francisco's industrial core, has seen significant redevelopment following the construction of AT&T Park and an infusion of startup companies. New skyscrapers, live-work lofts, and condominiums dot the area. Further development is taking place just to the south in Mission Bay area, a former railroad yard, which now has a second campus of the University of California, San Francisco, and where the new Warrior's stadium will be built. West of downtown, across Van Ness Avenue, lies the large Western Addition neighborhood, which became established with a large African American population after World War II. The Western Addition is usually divided into smaller neighborhoods including Hayes Valley, the Fillmore, and Japantown, which was once the largest Japantown in North America but suffered when its Japanese American residents were forcibly removed and interned during World War II. The Western Addition survived the 1906 earthquake with its Victorians largely intact, including the famous "Painted Ladies", standing alongside Alamo Square. 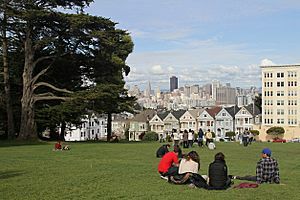 To the south, near the geographic center of the city is Haight-Ashbury, famously associated with 1960s hippie culture. The Haight is now home to some expensive boutiques and a few controversial chain stores, although it still retains some bohemian character. North of the Western Addition is Pacific Heights, an affluent neighborhood that features the homes built by wealthy San Franciscans in the wake of the 1906 earthquake. Directly north of Pacific Heights facing the waterfront is the Marina, a neighborhood popular with young professionals that was largely built on reclaimed land from the Bay. In the south-east quadrant of the city is the Mission District—populated in the 19th century by Californios and working-class immigrants from Germany, Ireland, Italy, and Scandinavia. In the 1910s, a wave of Central American immigrants settled in the Mission and, in the 1950s, immigrants from Mexico began to predominate. In recent years, gentrification has changed the demographics of parts of the Mission from Latino, to twenty-something professionals. Noe Valley to the southwest and Bernal Heights to the south are both increasingly popular among young families with children. East of the Mission is the Potrero Hill neighborhood, a mostly residential neighborhood that features sweeping views of downtown San Francisco. West of the Mission, the area historically known as Eureka Valley, now popularly called the Castro, was once a working-class Scandinavian and Irish area. It has become North America's first and best known gay village, and is now the center of gay life in the city. 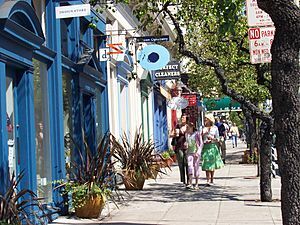 Located near the city's southern border, the Excelsior District is one of the most ethnically diverse neighborhoods in San Francisco. The predominantly African American Bayview-Hunters Point in the far southeast corner of the city is one of the poorest neighborhoods and suffers from a high rate of crime, though the area has been the focus of several revitalizing and controversial urban renewal projects. Among major U.S. cities, San Francisco has the coolest daily mean, maximum, and minimum temperatures for June, July, and August. 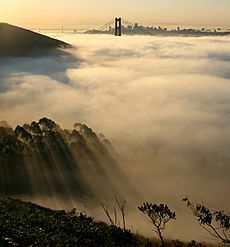 During the summer, rising hot air in California's interior valleys creates a low pressure area that draws winds from the North Pacific High through the Golden Gate, which creates the city's characteristic cool winds and fog. The fog is less pronounced in eastern neighborhoods and during the late summer and early fall, which is the warmest time of the year. San Francisco falls under the USDA 10a Plant Hardiness zone. The 2010 United States Census reported that San Francisco had a population of 805,235. 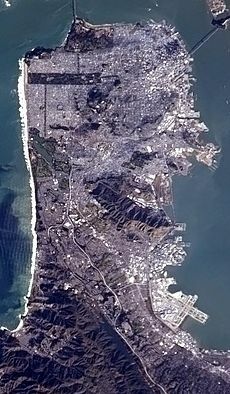 With a population density of 17,160 per square mile (6,632/km2), San Francisco is the second-most densely populated major American city behind only New York (among cities greater than 200,000 population). 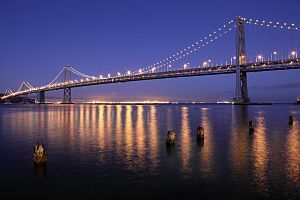 San Francisco is the traditional focal point of the San Francisco Bay Area and forms part of the five-county San Francisco–Oakland–Hayward, CA Metropolitan Statistical Area, a region of 4.6 million people. 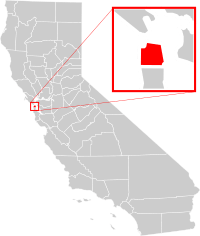 It is also part of the greater 12-county San Jose-San Francisco-Oakland, CA Combined Statistical Area, whose population is over 8.7 million, making it the fifth-largest in the United States as of July 1, 2015. The U.S. Census Bureau estimates San Francisco's population increased to 864,816 as of July 1, 2015. The principal Hispanic groups in the city were those of Mexican (7%) and Salvadoran (2%) ancestry. The Hispanic population is most heavily concentrated in the Mission District, Tenderloin District, and Excelsior District. The city's percentage of Hispanic residents is less than half of that of the state. San Francisco's African American population has declined to 6% of the city's population. The percentage of African Americans in San Francisco is similar to that of California. The majority of the city's black population reside within the neighborhoods of Bayview-Hunters Point, and Visitacion Valley, and in the Fillmore District. As of 2010[update], 55% (411,728) of San Francisco residents spoke English at home as a primary language, while 19% (140,302) spoke a variety of Chinese (mostly Taishanese and Cantonese), 12% (88,147) Spanish, 3% (25,767) Tagalog, and 2% (14,017) Russian. In total, 45% (342,693) of San Francisco's population spoke a mother language other than English. San Francisco ranks third of American cities in median household income with a 2007 value of $65,519. Median family income is $81,136. An emigration of middle-class families has left the city with a lower proportion of children, 15%, than any other large American city. The city's poverty rate is 12%, lower than the national average. Homelessness has been a chronic problem for San Francisco since the early 1970s. The city is believed to have the highest number of homeless inhabitants per capita of any major U.S. city. Homelessness, historically, has been a major problem in the city and remains a growing problem in modern times. The homeless population is estimated to be 13,500 with 6,500 living on the streets. 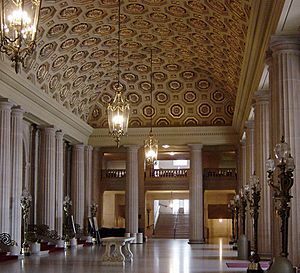 San Francisco has long had an LGBT-friendly history. It was home to the first lesbian-rights organization in the United States, Daughters of Bilitis; the first openly gay person to run for public office in the United States, José Sarria; the first openly gay man to be elected to public office in California, Harvey Milk; the first openly lesbian judge appointed in the U.S., Mary C. Morgan; and the first transgender police commissioner, Theresa Sparks. The city's large gay population has created and sustained a politically and culturally active community over many decades, developing a powerful presence in San Francisco's civic life. One of the most popular destinations for gay tourists internationally, the city hosts San Francisco Pride, one of the largest and oldest pride parades. San Francisco Pride events have been held continuously since 1972. The events are themed and a new theme is created each year. In 2013, over 1.5 million people attended, around 500,000 more than the previous year. BART, a regional Rapid Transit system, connects San Francisco with the East Bay through the underwater Transbay Tube. The line runs under Market Street to Civic Center where it turns south to the Mission District, the southern part of the city, and through northern San Mateo County, to the San Francisco International Airport, and Millbrae. San Francisco International Airport is the primary airport of San Francisco and the Bay Area. Cycling is a popular mode of transportation in San Francisco. 75,000 residents commute by bicycle per day. Bay Area Bike Share launched in August 2013 with 700 bikes in downtown San Francisco and selected cities south to San Jose. The San Francisco Municipal Transportation Agency and Bay Area Air Quality Management District are responsible for the operation with management provided by Alta Bicycle Share. The system will be expanded in the future. Pedestrian traffic is a major mode of transport. In 2015, Walk Score ranked San Francisco the second-most walkable city in the United States. San Francisco Facts for Kids. Kiddle Encyclopedia.